E.g. Canon EF 50mm F/1.8 STM, Canon EF 85mm f/1.8. e.g. 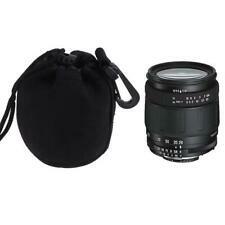 Canon EF 100mm F/2.8 L IS USM, Canon EF 70-300 F/4.5-5.6 L . e.g. Sigma 50-100 F/1.8, Canon EF 70-200 F/2.8. A belt loop and clip for convenient and secure transport. Compatible Brand Universal MPN Does not apply Brand Unbranded Type Compact Cases/Pouches To Fit Accessory:Lens Features With Strap Material Neoprene Colour Black Quality Perfect EAN Does not apply. 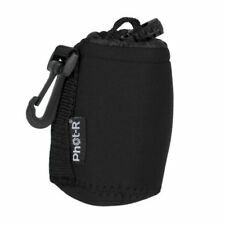 Neoprene Waterproof Soft Camera Lens Pouch Storage Bag Case Size- S M L new. Splash proof outer layer to further protect your lens from light rain. 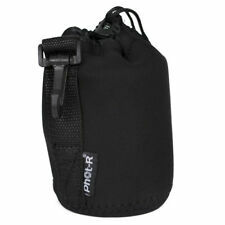 iGadgitz drawstring durable neoprene sleeve pouch designed to keep your lenses safe, clean and tidy. Space-efficient storage for light and compact transportation without the need of heavy or bulky cases. It is the perfect device to keep your lens safe inside a suitcase or bag when traveling or simply for storing it in a cupboard. Due to the water-resistant neoprene dust or humidity won't be able to get inside the pouch. 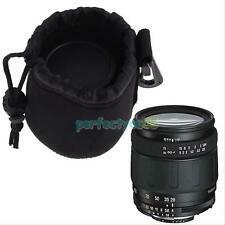 Splash proof outer layer to further protect your lens from light rain. 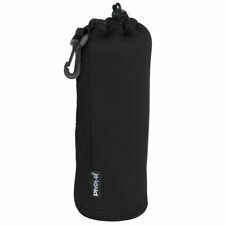 iGadgitz drawstring durable neoprene sleeve pouch designed to keep your lenses safe, clean and tidy. Neoprene Camera Lens Pouch Bag Condition: 100% Brand new Material: waterproof Neoprene, soft and flexible Wide-mouth opening for easy access Widely used to protect your lens from shock, bump, dirt, etc... With hook allows you attach the pouch to anywhere with a ring (such as camera bags and backpacks) Belt Loop - allows you attaching the pouch to your belt, for convenient carrying Protect your lenses from dust, humidity, and scratches with these lens pouches Please measure your device and compare it with the size above to ensure Pouch bag only,Accessory ONLY,lens not include! 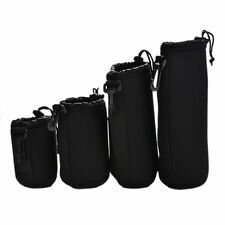 Color:Black Package Including: 1 x Small Size Lens Case Bag (S) (Pouch bag only,Accessory ONLY,lens not include!). Compatible Product Line EF 75-300mm f/4.0-5.6 III. Finished in an executive black, this case is both stylish and secure, providing great protection for your valuable device. COMPATIBILITY: Canon EF 75-300mm Lens. Material: Neoprene. Very soft and elastic, but durable to hold and protect your lens. Add greater convenience and ease in many shooting situations. Provide great protection and shock absorption for your lenses. 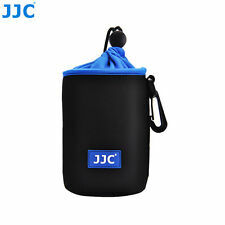 Neoprene Camera Lens Pouch Bag Condition: 100% Brand new Material: waterproof Neoprene, soft and flexible Wide-mouth opening for easy access Widely used to protect your lens from shock, bump, dirt, etc... With hook allows you attach the pouch to anywhere with a ring (such as camera bags and backpacks) Belt Loop - allows you attaching the pouch to your belt, for convenient carrying Protect your lenses from dust, humidity, and scratches with these lens pouches Please measure your device and compare it with the size above to ensure Pouch bag only,Accessory ONLY,lens not include! Color:Black. 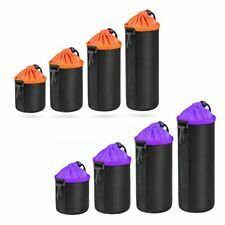 Made of neoprene, against water, dust and impact Durable, light and space-saving Extra padded bottom Cylindrical and drawstring closure design for better fit Wide-mouth opening for easy access Fitting for standard lens Size (Diameter x Height): Approx. 75mm x 160mm Color: Black weight: 40g Brand Unbranded MPN Does not apply EAN 4895187101918 EAN 4895187101918 Brand Unbranded MPN Does not apply. Material: Diving material (Neoprene). Waterproof neoprene, soft and flexible. 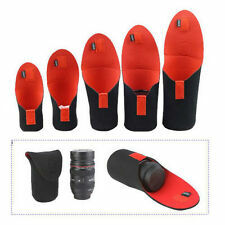 Widely used to protect your lens from shock, bump, dirt, etc. We will always here to solve them for you. It won't help the problem to be solved.